Protect your shoes agains rain, mud and snow with COVY'S Cover Shoes. This way your shoes stay in top condition all year round. COVY'S Cover Shoes come in a nicely stylized slimcase for storage. Available in distinguished black but also in cheerfull orange. It is Monday morning, a lovely weekend has passed by far to quickly and you will have to go to work again. When you open your curtains, you see that it’s raining cats and dogs. Again, your superb smooth leather or suede shoes made by for example Van Bommel, Greve, Crockett & Jones, Santoni, Magnanni, Church’s, Edward Green, Alden, Carlos Santos, Floris van Bommel or Fratelli Rosetti will become soaking wet which you hate, because they cost a serious penny, even though they do survive in the rain. Nevertheless, they will not gain quality when drowned. Hundreds of thousands of businessman around the world encounter this problem, especially if you are working in countries like the United Kingdom, the Netherlands or countries with a tropic climate, rain is nothing new. 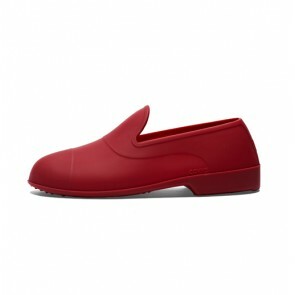 For this purpose, COVY’s has developed a high-quality cover shoe that will keep your feet and shoes dry. Whether you find yourself walking through water, mud or snow you won’t have to be afraid of any damage to your shoes any more. In winters, salt on the streets can harm the leather or suede, this won’t be able to happen any more. COVY’s cover shoes come in a convenient slim case so you can easily bring it with you or store it anywhere, for example in your car. COVY’s cover shoes come in 3 different sizes and 4 different colours. S is perfect for 39-42, M for 42-44 and L for 44-46. If you have a shoe size which is covered by two COVY'S sizes, we advise, if you have a shoe of normal width, to choose the smaller COVY'S size. COVY’s cover shoes are made in one colour only, in black, brown, orange or red. So whether you are on your way to work, have to visit a building site or just want to water your garden and don’t want to put off your very comfortable Crockett’s, buy COVY’s Cover Shoes!